Black R&Y Augousti large round pen shell box. R&Y Augousti Shagreen Desk from Paris. 47.5"W x 24.5"D x 29.5"H.
Wooden signed humidor box by Clayton LeFevre. Square leather African box with lid and springbok hide. 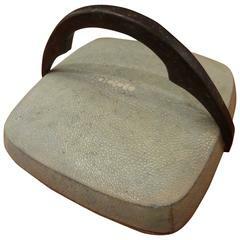 Rectangular leather African box with lid and animal hair. 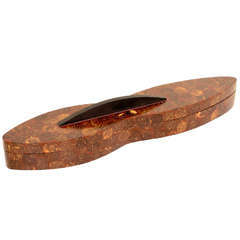 Beautiful decorative box with patterned coconut shell inlay. Unsigned but attributed to R&Y Augousti Paris, circa 1989. 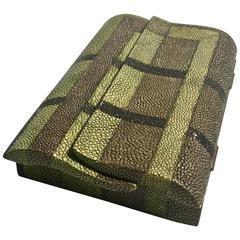 Fantastic shagreen clad decorative box. Vintage box by R & Y Augousti from Paris. Shagreen outside. Wood inside. Bonze handle. Size: 5" x 5" x 3.5 high. 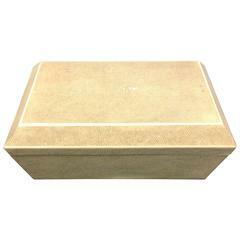 Signed with a plaque in the interior and also signed on the bottom, this R & Y Augousti shagreen box is absolutely stunning.